So Christmas came around and I offered to bring them for Christmas breakfast with my parents and brother. Well, they didn’t make it to that breakfast either. I guess I underestimated how exhausted I would be from prepping for a full Christmas Eve dinner at our house for Kyle’s family and getting everything ready to bring down to Long Island for Christmas Day (including my frozen cheesecake that never made it down for Thanksgiving dessert). So I set my mind to make these buns during my week off after Christmas and I finally did it. They turned out to be a wonderful way to welcome in the new year on New Year’s Day morning! We just loved them! The process was a simple one and of course, Peter Reinhart’s instructions are always straightforward and easy to follow. I’m starting to feel much more comfortable working with yeast and this was the recipe that made me feel confident enough in my abilities to try out some bagels. I took Rebecca’s suggestion of pairing the rolls with some cream cheese icing rather than Reinhart’s sugar fondant glaze and while I thought the icing tasted fabulous, I think the sugar fondant glaze would have added the additional amount of sweetness these buns needed, believe it or not. The recipe calls for raisins and since I wasn’t sure how Kyle would feel about them in the rolls, I made half of the rolls with and half without the raisins. Next time all of the rolls will have raisins since we absolutely loved the plumped-up raisins with the cinnamon-sugar filling. I also lathered the dough up with some melted butter before sprinkling on the cinnamon and sugar which added a bit of richness that the dough didn’t have on it’s own since it wasn’t a brioche dough (this addition is shown below). Thanks to Rebecca for this suggestion as well – genius!! 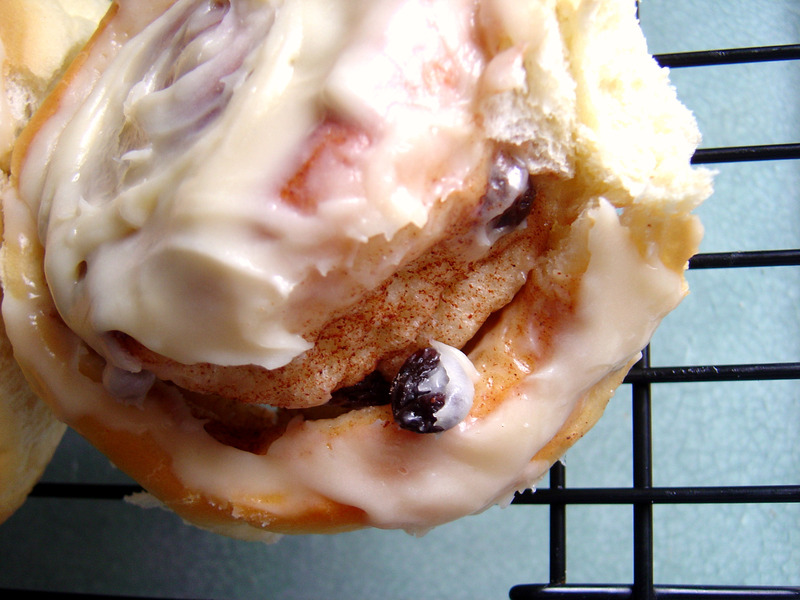 I will definitely make this recipe again and next time I think I’ll give Reinhart’s brioche recipe a chance to pair up with the awesome cinnamon-sugar-raisin-sugar-glaze combination that is this recipe. 1. In a standing mixer fitted with the paddle attachment, cream the sugar, salt and shortening on medium-high speed. Whip in the egg and lemon extract until smooth. Then add the flour, yeast, and milk. Mix on low speed until the dough forms a ball. Switch to the dough hook, and increase the speed to medium, mixing for approximately 10 minutes, or until the dough is tacky but not sticky. Lightly oil a large bowl and transfer the dough to the bowl, rolling it around to cover it with oil. Cover bowl with plastic wrap. 3. Mist the counter with spray oil, and transfer the dough to the counter. Roll out the dough with a rolling pin, lightly dusting the top of the dough with flour. Roll it into a rectangle about 2/3 inch thick and 14 inches wide by 12 inches long for larger buns, or 18 inches wide by 9 inches long for smaller buns. Brush melted butter over the dough then sprinkle the cinnamon sugar over the surface of the dough. Sprinkle on the raisins and gently press them into the cinnamon-sugar. 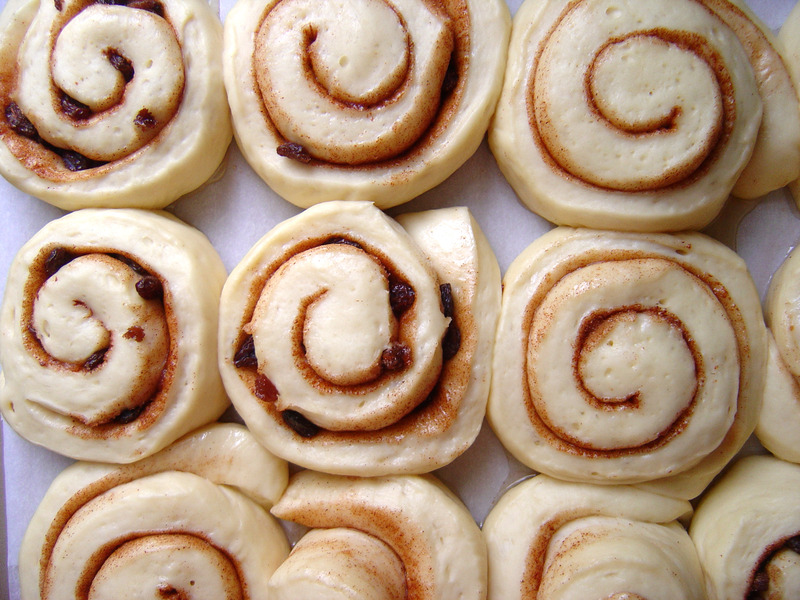 Roll the dough up into a log, creating a spiral as you roll. With the seam side down, cut the dough into 8 to 12 even pieces, each about 1 3/4 inches thick for larger buns; or 12 to 16 pieces each 1 1/4 inch thick for smaller buns. 4. Line 1 or more sheet pans with baking parchment. Place the buns approximately 1/2 inch apart. 5. Proof at room temperature for 75 to 90 minutes, or until the pieces have grown into one another and have nearly doubled in size. 8. Cool the buns in the pan for about 10 minutes, and then glaze the tops. Remove the buns from the pans, and place them on a cooling rack. Wait at least 20 minutes before serving. In a standing mixer fitted with a paddle attachment, combine cream cheese, powdered sugar, butter and vanilla. Spread glaze on rolls.